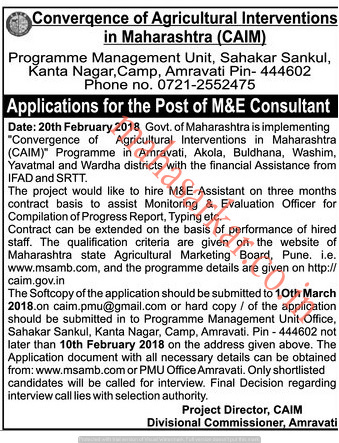 CAIM Amravati (Convergence of Agricultural Interventions in Maharashtra),Amravati Published Job Notification for M&E Consultant Posts. Candidates who wish to apply must look at CAIM Amravati M&E Consultant Recruitment 2018. Eligible candidates can apply Online before 10-03-2018. Starting Date, Last Date to Apply Online at Convergence of Agricultural Interventions in Maharashtra which candidates should be remembers as follows. Start Date to Apply Online: 20-02-2018. Last Date to Apply Online: 10-03-2018. 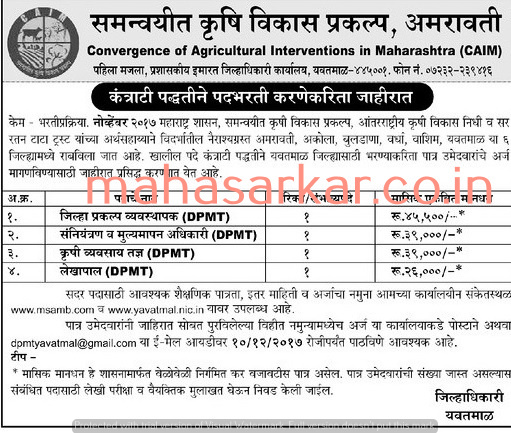 CAIM Amravati (Convergence of Agriculture Interventions in Maharashtra), Amravati Published Job Notification for 09 Project Manager – Regional Agricultural officer & Many More Posts. Candidates who wish to apply must look at CAIM Amravati Project Manager – Regional Agricultural officer & Many More Recruitment 2018. Eligible candidates can join Walk-in Interview on 23-01-2018. Interested & Eligible candidates may attend for walk in interview along with all the documents addressed at Hall-01,Collector Office ,Camp, Amravati 444602. Starting Date, Last Date to Apply offline at Convergence of Agriculture Interventions in Maharashtra which candidates should be remember as follows. 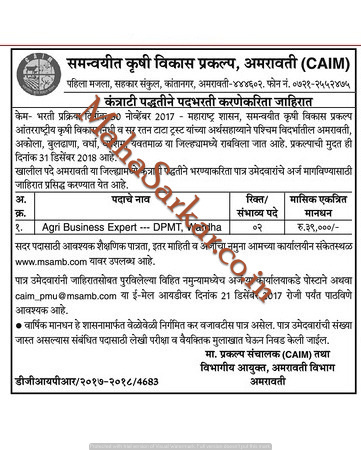 CAIM Amravati (Convergence of Agricultural Interventions in Maharashtra), Amravati Published Job Notification for 02 Agri Business Expert Posts. Candidates who wish to apply must look at CAIM Amravati Recruitment 2017. Eligible candidates can apply online before 21-12-2017 (21st December, 2017). Education Qualification: Graduation degree. For Post wise Education Details follow the detailed advertisement. Interested & Eligible candidates can send their application along with all the necessary documents and testimonials to caim_pmu@msamb.com. Starting Date, Last Date to Apply Online at Convergence of Agricultural Interventions in Maharashtra which candidates should be remember as follows. Start Date to Apply Online: 14-12-2017. Last Date to Apply Online: 21-12-2017. CAIM Amravati (Convergence of Agricultural Interventions in Maharashtra), Amravati Published Job Notification for 04 District Project Manager – Accountant & More Posts. Candidates who wish to apply must look at CAIM Amravati Recruitment 2017. Eligible candidates can apply offline before 10-12-2017. Education Qualification: Graduate/Post Graduate/Master Degee and More. For Post wise Education Details follow the detailed advertisement. Interested & Eligible candidates can send their application along with all the necessary documents and testimonials Email to dpmtyavatmal@gmail.com. Starting Date, Last Date to Apply offline at Convergence of Agricultural Interventions in Maharashtra which candidates should be remember as follows. Start Date to Apply offline: 30-11-2017. Last Date to Apply offline: 10-12-2017.